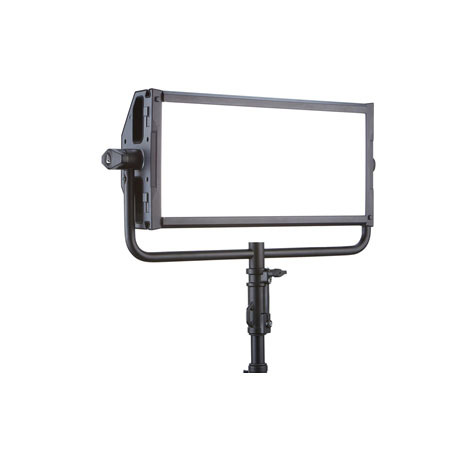 Flexibility and control are key to the creation of the Gemini 2×1 Bi-Color LED Soft Panel with Standard Yoke and UK Power Cable from Litepanels . The CCT color temperature control has 6 factory presets in increments from 2700 to 6000K. There are also 6 presets for user-defined color temperature and plus/minus green control. The HSI Color mode allows you to adjust the hue, saturation, and intensity, while Gel mode permits your choice from a library of filters often used by image makers. The Gemini is dimmable from 100 to 0% without flicker or color shift. Settings and features are displayed on the rear LCD screen. All of these adjustments can be made locally on the unit or remotely via a console, thanks to the Gemini’s built in DMX. There’s even the option of wireless DMX or Bluetooth control via a separately purchased remote module.